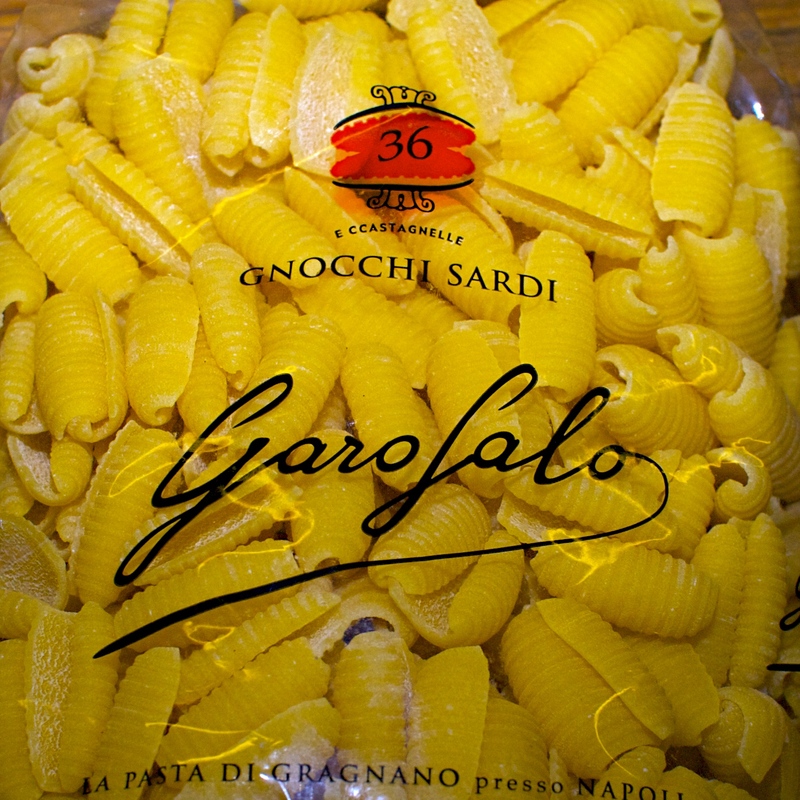 Gnochetti sardi is a Sardinian pasta shape which is shaped like gnocchi but made of durum wheat semolina and no eggs. It is a staple in Sardinia and usually prepared with a heavy tomato based ragù or sauce made with beef, lamb or sausage. The ragù clings to the heavy ridged pasta shape. 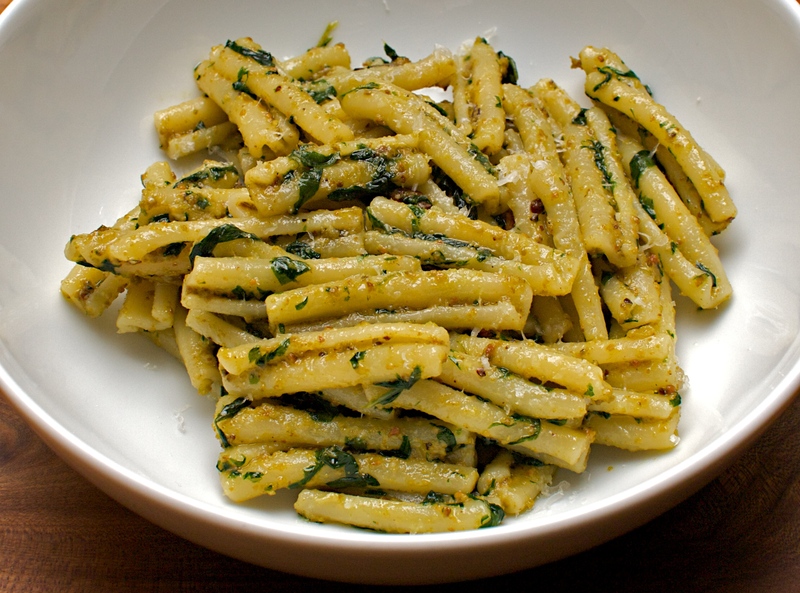 If you can’t find gnochetti sardi then another short pasta shape, like penne, will do. This will serve 4 as a main course but stretches to many more as a first course which is how we like to serve it. Soak the porcini mushrooms in 100ml of boiling water for about 30 minutes. Drain the mushrooms and chop but don’t throw away the soaking liquid as you’ll need it later. Bring a really large pan of salted water to the boil. Meanwhile, skin the sausages and break the meat up into little pieces. Heat the oil in a large frying pan, then add the onion, garlic, chilies and fennel seeds and fry gently until nicely coloured. Add the sausagemeat and mushrooms and continue to fry for another 5 minutes. Add the wine and bubble for a couple of minutes to reduce, then add the tomatoes and mushroom soaking liquid. Season well with salt and pepper. Leave the sauce to simmer for about half an hour. Cook the pasta according to the pack, then drain and add to the sauce. Pass around the cheese and let people help themselves. Drink with: the Sardinian red wines would work a treat, especially the ones made from Cannonau or Carignano. These two grape varieties are better known as Grenache and Carignan, so if there are no Sardinian gems in the local, find something made from these grapes and you’ll have a match. 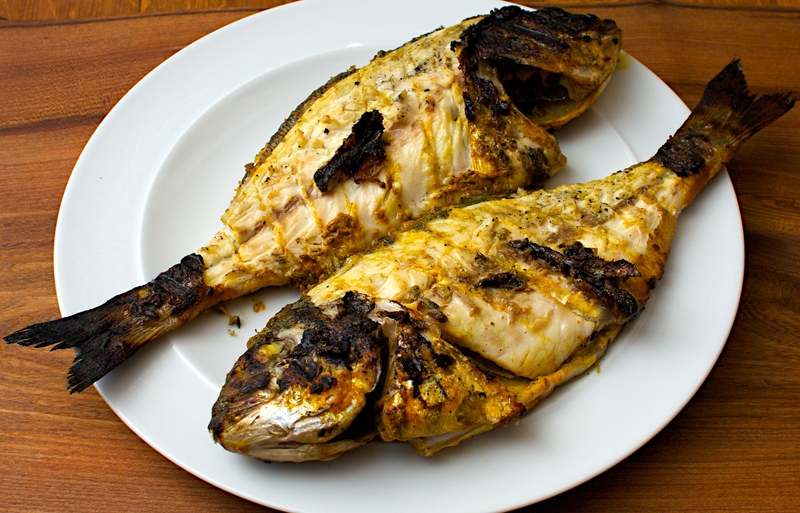 This is a Basque inspired dish where fresh fish is cooked really simply over hot coals. Firm fish like Monkfish, or Grouper, will not fall apart as easily so make them perfect for barbecuing. Serve with a green salad and some bread. Light the barbecue and wait until it is really hot before you start cooking. 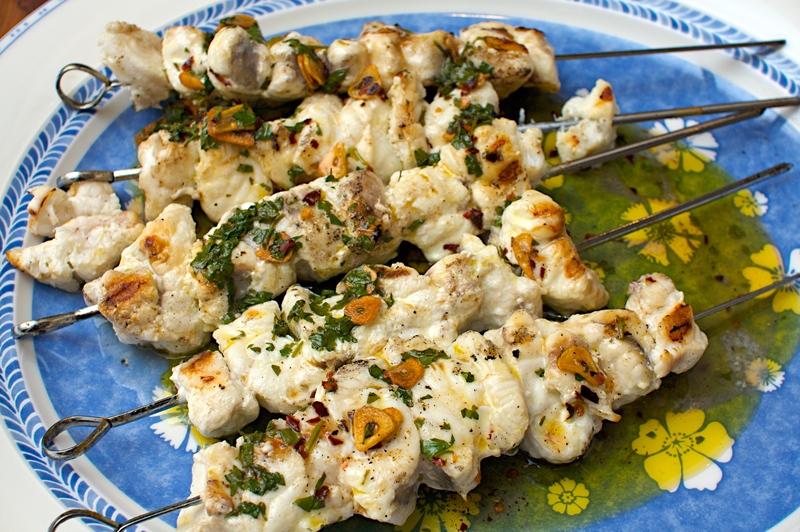 Thread the monkfish onto 4 metal skewers. Make a marinade using 6 tbsp of the olive oil, the lemon juice, 3 tbsp of the white wine vinegar and 1 tsp salt. Brush this lightly over the kebabs and barbecue until the fish is browned and cooked through. Keep brushing with the marinade as the fish cooks. Put 6 tbsp olive oil, the garlic and chilli flakes into a small pan and heat over a high heat until the garlic turns golden (but don’t let it go brown as it will turn bitter). Take off the heat and stir in the parsley, 1 tbsp white wine vinegar and ½ tsp salt. Drizzle over the fish and serve. Drink with: a chilled glass of Txakoli if you can find it. This Basque speciality is hard to find outside Spain but an Albarino from Galicia makes a more than satisfactory substitute. Our local supermarket, which will remain nameless, has perfectly ripe Spanish peaches at the moment. Absolutely perfect for a summer barbecue salad. It’s worth paying the extra for free-range chicken from a reliable source (probably not the local supermarket). Put the chicken breast in a shallow dish. Add 1 tbsp balsamic vinegar, 1 tbsp olive oil and plenty of salt and pepper. Turn the chicken breasts in the marinade until they are well-coated. Cook the chicken on the hot barbecue until cooked through (ours took about 6 minutes on each side). You are going to slice the chicken anyway so it’s no problem to slice open one of the fillets to check. Scatter a good few handfuls of spinach and a small handful of basil leaves over a large serving platter. Mix 1 tbsp balsamic vinegar, 2 tbsp olive oil, a few shredded basil leaves and some salt and pepper together to make a dressing. 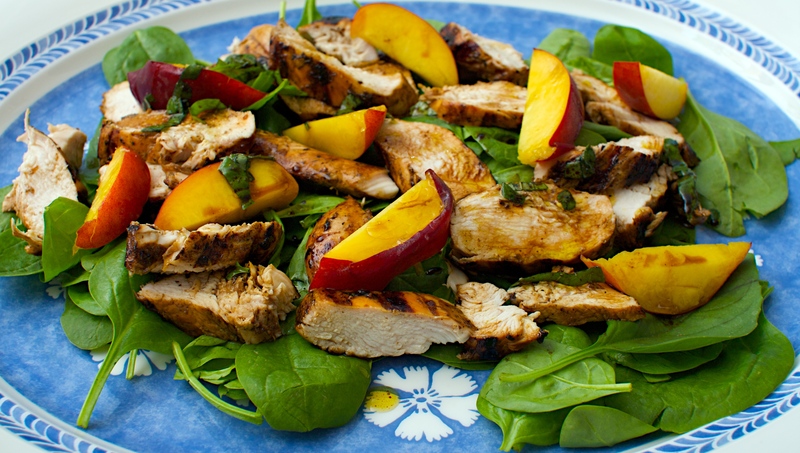 Slice the chicken and peaches and toss gently with the salad leaves. Drizzle over the dressing and serve. Drink with: either Roussanne or Marsanne with their stone-fruit flavours to complement the light peachy flavours of the salad. We had a glass of a St Joseph white from Pierre Gaillard made from Roussanne which is amazing on it’s own and a perfect match for this dish. We didn’t brush the grill of our barbecue well enough to prevent the skin sticking to it. If you’re cooking fish on a barbecue learn from our mistakes and brush the grill down well and rub with a bit of oil to stop it sticking. You can also season the fish with salt and set it aside for 15 minutes or so before cooking which will draw the moisture out of the skin. Alternatively you can take the extra safe precaution of cooking the fish on some tinfoil. This is a delicious way to cook fish and you get the flavours of the garlic, ginger and Tikka flavours with the added barbecue smokiness which works a treat and can be served with a fresh cucumber, tomato and coriander salad. Slash the skin of the fish on either side and place in a shallow dish. Mix the ginger and garlic, season with salt, then rub all over the fish. Mix the yoghurt with the oil, spices and seasoning. Pour this over the fish and rub it all over the fish with your hands, inside and out. Cook for about 6 minutes on each side and serve with an Indian-style salad. Drink with: a chilled bottle of Singha beer, preferably outside in the sunshine. The watercress has finally arrived in Caviston’s, one of our favourite vegetable shops. The seasons seem to be all out this year and we can’t predict when produce will be there and at it’s freshest. The bags you buy in supermarkets just don’t taste like the real thing at all so catch it while you can as it mightn’t be here for long! This soup can be on the table under 10 minutes if you want. We love asian soups as they have great depth of flavour and really zing with freshness. 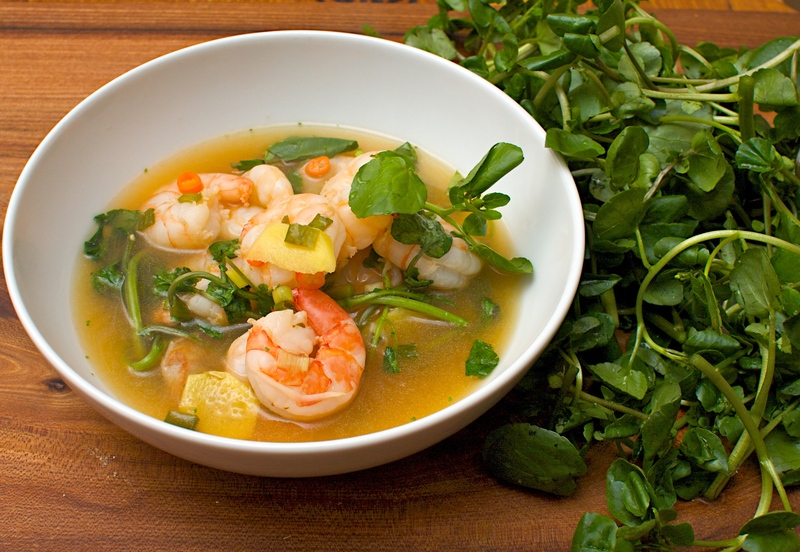 Put all the ingredients except for the prawns and watercress into saucepan and bring to a simmer. Cook for a minute, then add the prawns and cook until they turn pink. Stir in the watercress and take off the heat. Taste and add another teaspoon of sugar if necessary. Drink with: a non-Burgundy Pinot but not from a hot climate. We tried one from San Gimignano in Tuscany which had lovely juicy fruit but was still nice and light without too much tannin which tends to clash badly with chilli. A surprisingly good choice and one that will be repeated. This is a classic Sicilian dish. 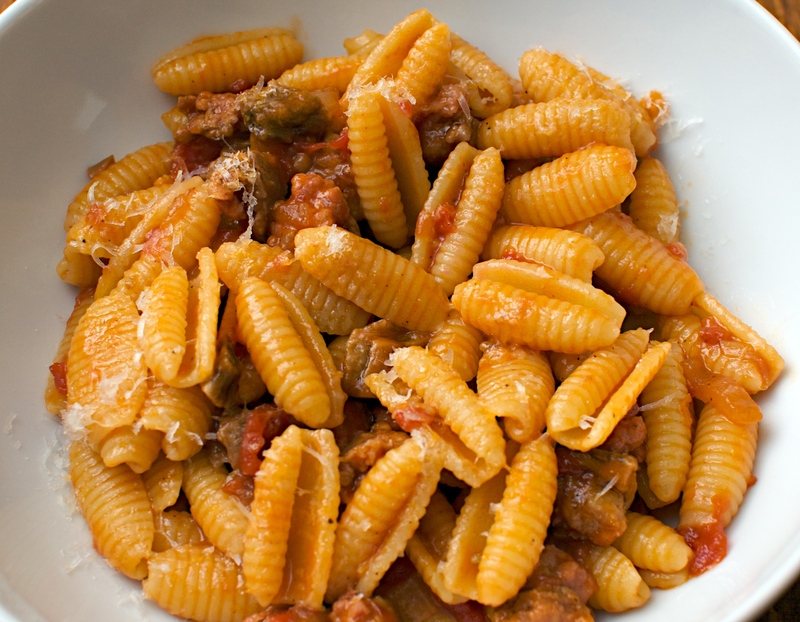 Casarecce is the pasta shown in the picture but you can use penne if you can’t find it. You can roast the pistachio’s in advance but don’t chop them until you are ready to make the pesto as they will go rancid very quickly once their oils are released. Heat the oven to 180C/350F/gas 4. Spread the pistachios out on a baking tray in a single layer and roast for about 8 minutes. Check them near the end to ensure they don’t burn. Chop the pistachios. Take ¾ of the pistachios and the garlic and pound to a paste with a pestle and mortar. Pound the basil into the paste, then gradually add the olive oil. Add the remaining pistachios and the pecorino and pound just briefly to make sure you keep some pieces of pistachio. Season. Cook the pasta in lots of boiling salted water until al dente. Drain and put the pasta back in the pan, reserve a little of the cooking water. Toss the pasta with the pesto and add a bit of the cooking water to loosen if necessary. Grate over some more pecorino to serve. Drink with: We tried a Vermentino from Colli di Luni DOC (Hills of the Moon) in the hills of Liguria in Italy which worked very well and is a classic partner for Pesto dishes. To be even more authentic to the dish we would suggest something Sicilian made from Grillo; you need minerality, nuttiness, fresh acidity and fruitiness wrapped in a medium bodied wine. This is a delicious recipe from Marcella Hazan’s The Essentials of Classic Italian Cooking. Marcella recommends using canestrelli which are tiny little sweet scallops which are also know as Queen Scallops or Queenies. We didn’t have canestrelli to hand when we made this but achieved a similar effect by chopping up larger scallops so there are lots of little pieces through the dish. Serve the sauce with spaghettini if you can get it, but thicker spaghetti will work too. Wash the scallops in cold water, pat dry with a tea towel and cut into little pieces about 9mm thick. Put the olive oil and garlic in a saucepan, turn the heat to medium and cook until the garlic becomes pale gold, add the parsley and chilli. Stir and add the scallops and a couple of large pinches of salt. Turn the heat to high, and cook for about 90 seconds, stirring often, until the scallops become opaque and loose their shine. Careful not to overcook them or they will be tough. Taste and adjust the seasoning. If there is a lot of liquid in the pan, remove the scallops with a slotted spoon, and boil down the watery juices. Return the scallops to the pan, turn quickly, then take off the heat. Toss well with the cooked spaghettini, add the breadcrumbs and toss again. Drink with: An easy, simple and fruity Grüner Veltliner (GV) works well by not overwhelming this delicate sauce and the spicy white pepper spices in GV complement the spices and chilli in the dish. Don’t spoil the balance by getting a powerful and complex GV.